Hip replacement surgery, for most patients, is a procedure that yields great gains in mobility, as well as relief from chronic joint pain. However, it isn't a quick and easy solution to hip problems. Replacement procedures are major surgery, and recovery takes a lot of time, patience, and above all, hard work. Careful preparation for your procedure and rehabilitation can make healing faster and easier. Spending a few weeks preparing your hip for surgery can be to your advantage, reducing recovery time after hip replacement. The muscles and connective tissues surrounding your hip will be stretched, strained and manipulated by the surgeon as your new hip implant is being maneuvered into place. Going into surgery with those muscles in the best possible shape will minimize the damage done to them by all that stress, speeding the healing process. Pilates exercise for hip replacement is a very good option for hip conditioning. 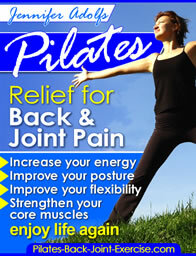 In fact, Pilates is used by therapists for rehabilitation after knee or hip replacement. So join a Pilates class at your local gym, or see a physical therapist and get to work on those hip muscles to ensure that they are strong, flexible and resilient. Those weeks of delay spent conditioning your hip for surgery will give you time to do some research on hip replacement and discuss some important details with your health care team. Among the issues that you should pay special attention to is hip implant options, since the one you choose can affect your risk of complications. Metal-on-metal hip implants have been troublesome over the last few years, with several faulty or poorly designed models recalled due to high rates of premature failures and serious complications. Metallosis was a problem for some patients; this is a serious condition related to metallic debris that is shed from the hip implant. In patients who suffer from metallosis, that debris collects in the soft tissues around the implant, causing irritation that can lead to intense pain and swelling in the hip, tissue death, bone loss and implant loosening. While some recalls have taken place — including the Stryker Rejuvenate implant — several similar metal-on-metal products are still on the market, so looking into the risks involved with any implant is important. Rehabilitation is an essential part of hip replacement success. Patients who start therapy early and work hard at it have been shown to have faster and more complete recoveries than those who do not make therapy a priority. Therapy should begin almost immediately after surgery, when you should be encouraged to sit up and move, which reduces your risk of blood clots and other post-surgery complications. Within a day, you should be walking with assistance. After your discharge from the hospital, therapy should continue for at least six to eight weeks to ensure that strength, flexibility and range of motion are rebuilt during the healing process. This can be done at home or on an outpatient basis. However, many patients opt to check into rehabilitation hospitals, since they typically offer more advanced programs and equipment for a faster and more efficient recovery. Elizabeth Carrollton writes about defective medical devices and dangerous drugs forDrugwatch.com. Leave hip replacement surgery and find out more ways that Pilates exercises can help strengthen your hips again.